Foreign affairs dominated the Sunday news programs, as Israeli-Palestinian talks approach their expiration date and the G7 announced plans to further sanction Russia. Israeli Prime Minister Benjamin Netanyahu appeared on State of the Union to discuss the breakdown of the Israel-Palestinian peace talks and refuted claims that he was using the unity deal as an "excuse to walk away" from the talks. 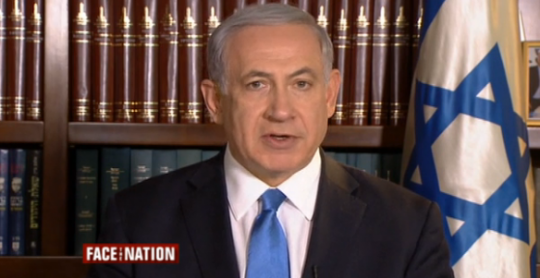 "It's the very opposite," Netanyahu told CNN’s Candy Crowley. "I chose deliberately, openly, specifically, to negotiate with that part of the Palestinian people that said it was willing to make peace with Israel. I said we're not going to try to include the other part that seeks our extermination, and that's what I did. I've been very consistent on this. Now that he's joined them, I say this: unity for peace is good. Unity with Hamas, that seeks to exterminate Israel—the opposite of peace, is bad. I've always been consistent on this. I negotiate with those who are willing to make peace with my country. I will not negotiate with those who seek to exterminate peace with my country, whether they sit in the front office or the back office." "I do seek a two-state-for-two-peoples solution. If I can’t have it right away with this Palestinian government then we’ll seek it other ways," Netanyahu said, "The simplest way to get back to the peace process is to have President Abbas renounce the pact with Hamas and come back to negotiations." Netanyahu addressed President Mahmoud Abbas through CBS’ Face the Nation saying, "President Abbas, tear up you pact with Hamas. Recognize the Jewish state. Make peace. I hope you do that, but you can’t have both Hamas and peace with Israel." Netanyahu reiterated that he would not negotiate with the Palestinian Authority if they have ties with Hamas. Peace talks are set to expire on April 29. Ukraine remains in the news as Russia ratchets up pressure on its neighboring state. The White House highlighted that rougher sanctions would go into effect on Monday. "A week ago, the Russians signed onto a road map to deescalate the crisis in Ukraine. Unfortunately, they haven’t lived up to any of the commitments they made in that agreement. So on Friday… the president convened a call with all of the senior European leaders and they agreed that starting this week we would exert additional pressure on Russia through sanctions, and that will begin to roll out as early as tomorrow," White House Deputy National Security Adviser Tony Blinken said on Face the Nation. While Republicans are calling for a stronger response, Blinken maintained that the past sanctions have had an effect and the new sanctions would work. "[Putin] had a compact with his people and the compact is this, ‘I’ll deliver economic growth for you if you remain politically complacent.’ The growth started to dry up at the beginning of the year and then this crisis hit, and through Putin’s actions he’s isolated Russia, isolated his economy and the steps we’ll take will further that… That means that the compact he has with his people is in great jeopardy. He has to make a very hard choice. He can either continue to do what he’s doing in Ukraine or pull back, engage in a diplomatic process and take some of that pressure off," Blinken explained. Ranking Member of the Senate Foreign Relations Committee Sen. Bob Corker (R., Tenn.) said that the administration is not doing enough. "These targeted sanctions against individuals just are not affecting Putin’s behavior enough, and I think you’ve noticed the red line has now moved. Last week, the red line was demobilizing the forty thousand troops that are on the border that are intimidating people inside Eastern Ukraine, now it’s just him not going in," Corker said on Face the Nation. Sen. John Barrasso (R., Wyo.) echoed that sentiment on CNN’s State of the Union. "Sanctions need to be consequential. And what we hear are sanctions against individuals. I think we need to go much further," Barrasso said. Barrasso was one of three Republican senators who authored an opinion piece in the Washington Post advocating that "in short term, the United States must expand sanctions to major Russian banks, energy companies and other sectors of Russia’s economy." This entry was posted in Issues and tagged Benjamin Netanyahu, Israel, John Barrasso, Ukraine. Bookmark the permalink.